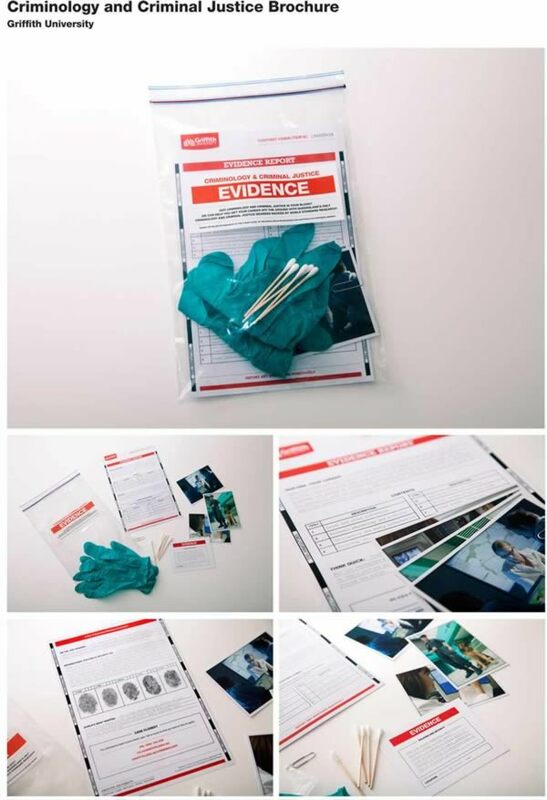 Australian ad agency Junior was asked to make a brochure for a criminology course at Griffith University. The purpose was to make the brochure more relevant to recent high school graduates. The solution was a very different sort of brochure. 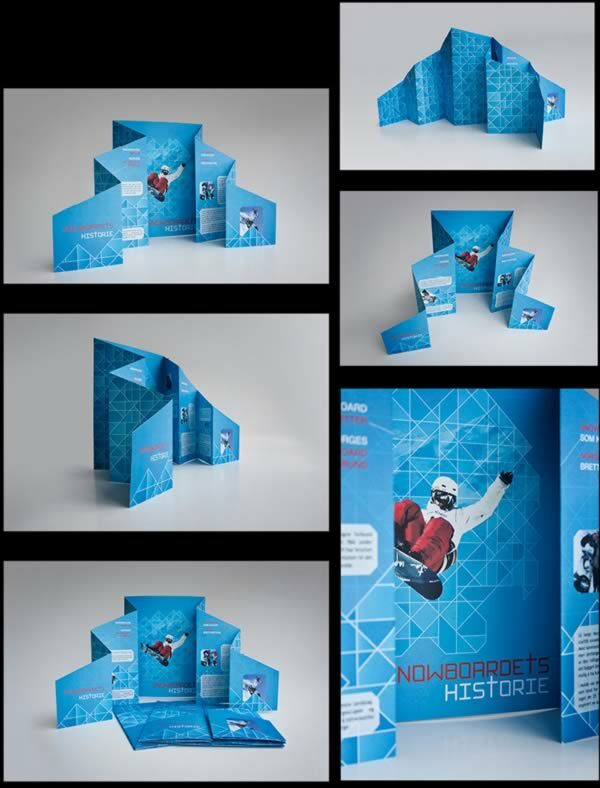 Check out this snowboarding brochure in the shape of a snow mountain. 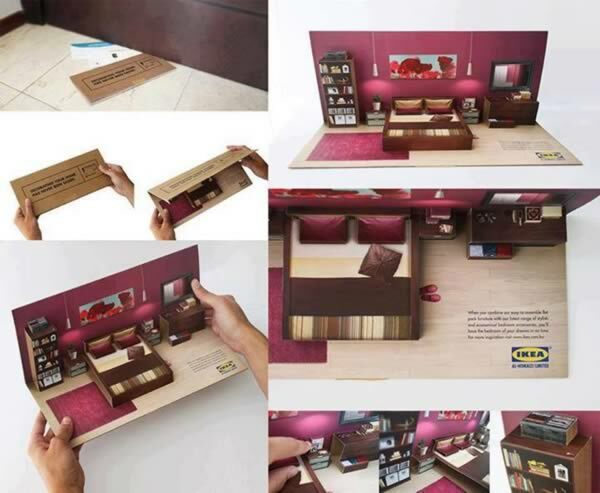 A very cool brochure from Ikea. When opened, all of the furniture in the room pops up. plAAy was a contemporary exhibition of Asian art in Blackburn, U.K., displaying works themed around the concept of play. 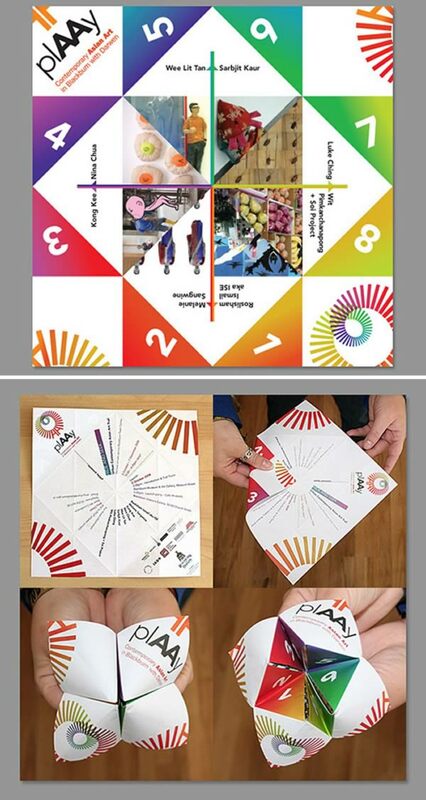 Source Creative, the ad company responsible for the art, developed a brand identity which included a "Chinese fortune teller" invite and a program booklet that folded out to a poster. Rubik's Cube fever set the world on fire during the 80s, and it seems that fire cannot be extinguished easily. 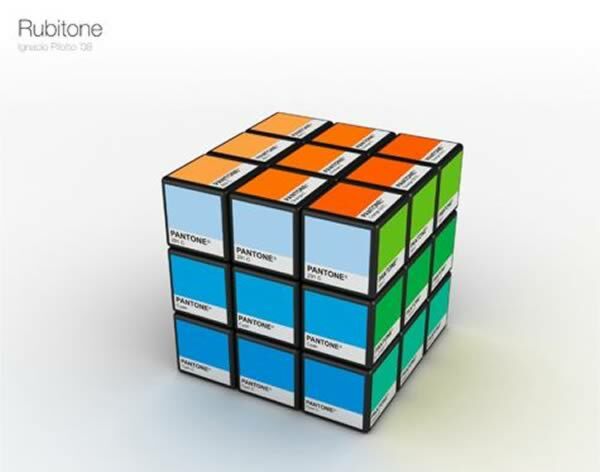 Ignacio Pilloto came up with a very innovative and fun way to replace the usual Pantone demo paint pallet with this Rubik's Cube. Selecting a suitable color for your room will not only be simple, but fun at the same time! For years, The University of Aarhus had experienced a decline of enrollment in the natural sciences. 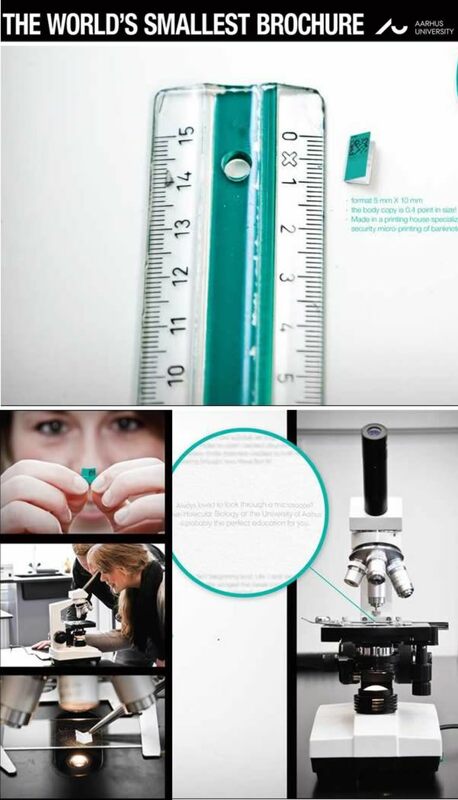 So, for the study of molecular biology, ad agency Uncle Grey in Århus, Denmark, built a campaign around the a basic tool students use in molecular biology – the microscope. Uncle Grey created a brochure so small that it was only possible to read the text through a microscope. 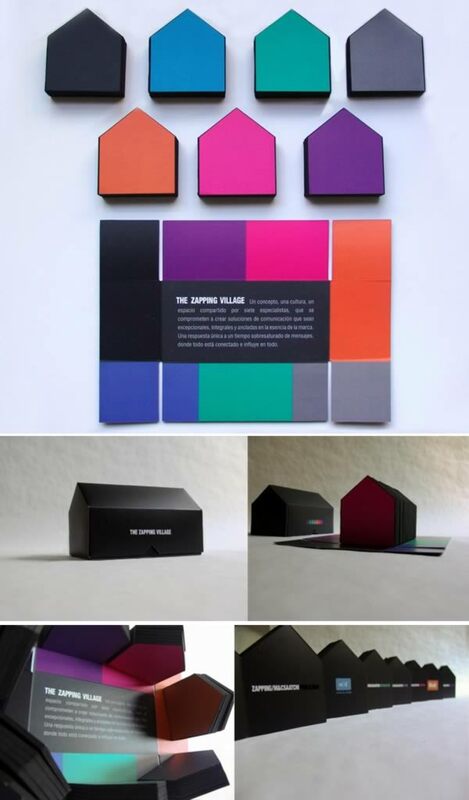 The brochure measured only 5 mm x 10 mm and the text was specially printed with an incredibly tiny point size of only 0.4. The brochure was handed out to students at all major colleges. Konami brings games to life, so this 3D pop- up brochure was used to target casinos by advertising its interactive games and 3D capabilities. These brochures designed by Blammo for Cougar boots and were placed in parks and hiking trails in urban areas in Canada. Like the boots they advertise, the brochures are completely waterproof, cold-proof, and indestructible. “The Zapping Village Brochure" was created by agency Zapping M&c Saatchi. When Red Bull's design consultancy, Parker White, wanted a show-stopping media pack and program for the Red Bull Air Race World Championships in New York, they approached pop-up paper engineers, Papersmyths. The book comprised six spreads, two of which were pop-ups: the first pop-up featured a flying Red Bull plane speeding through the pylons in front of the magnificent Manhattan skyline while the second pop-up showed the Red Bull pilots.